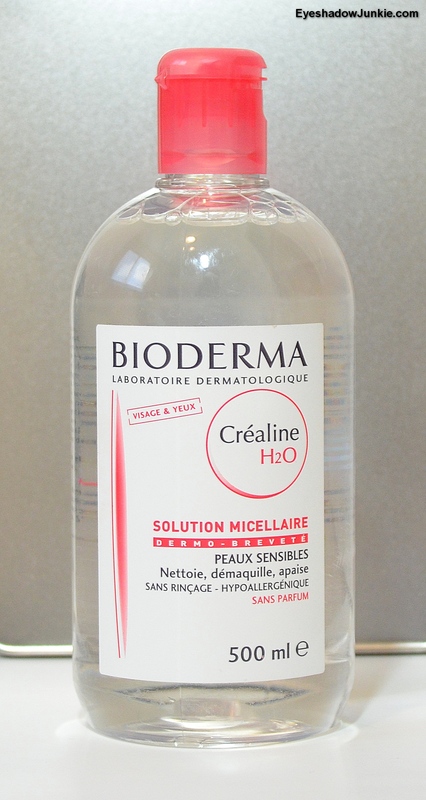 I was very impressed immediately after being introduced to Bioderma Crealine H2O cleansing water. This is the best makeup remover I’ve ever tried. Granted all of the previous removers I’ve used can be purchased at Walgreens or Target. The problem I had with those oil-free, drug store removers was that I was always left with a white residue on my skin. That residue is difficult to remove without using a harsh cleanser. So the only time I used them was when I was desperate to remove stubborn liner. I had gotten into the habit of scrubbing my face to remove my makeup, even my eye makeup. Occasionally, if I scrubbed too hard, the skin around my eye would become overly sensitive and would burn after applying my green tea /apple cider vinegar toner. It was after the latest ‘burning’ incident that I stumbled across an article on Beautylish discussing cleansing water. The post was written by Lisa Eldridge, a professional makeup artist who has a fantastic YouTube channel and blog. She also spoke of Bioderma on her channel a while ago, but I was determined to keep scrubbing and burning. Who needs a gentle eye and face makeup remover, that doesn’t leave a white residue, removes waterproof makeup with lightning speed without rubbing and without leaving your skin red from irritation? Uh…me. This product is fragrance-free, alcohol-free and phenoxyethanol-free (preservative). Bioderma is a French company and their products can only be purchased online here in the States. I purchased my 500ml bottle for $28 at Amazon, but smaller bottles are available for $10 (100ml).